…And Then is a brand-new studio album from veteran New Jersey band Speed The Plough. It was recorded in 2017 by John, Toni and Mike Baumgartner and Ed Seifert, joined by former STP bassist Dan Francia and drummer Ken Meyer (Life in a Blender, The Thousand Pities) at Mix-o-lydian Studios and at the group’s home studio, Ruff Tracks. It’s being released via download and streaming services December 8. …And Then represents a return to the band’s more stripped-down origins… sparse, a little psychedelic, heartfelt. And, in a departure for this outfit, this collection boasts a pair of covers – one by Eno and Bartok apiece; STP are trying to keep good company! Two more tracks comprise an even bigger surprise. Speed the Plough rose out of the ashes of The Trypes, a group formed in 1982 by the Baumgartners, Marc Francia and Elbrus Kelemet, and later joined by Feelies Glenn Mercer, Bill Million, Dave Weckerman, Stan Demeski and Brenda Sauter. The new album boasts two bonus cuts performed by the original members of The Trypes – John, Toni, Marc, Glenn, Brenda and Elbrus – revisiting songs from the band’s beginnings. The core trio of John, Toni and Marc began playing as STP in 1984 and would lead numerous iterations of this outfit over the years, with alumni that’d include Rich Barnes and Chris O’Donovan (of Wild Carnation), Stanley Demeski and Brenda Sauter (of The Feelies), NPR host Jim DeRogatis, John Neilson (Wharton Tiers), and veteran DJ Frank O’Toole. STP released four full-length albums on the East Side Digital label: Speed The Plough (1989), Wonder Wheel (1991), Mason’s Box (1993) and Marina (1995). In addition, they released a limited-edition single on the French label Acetone and had songs featured in two independent films: Strangest Deams (1990) and Paradise Park (1993). After a long hiatus, Speed the Plough was re-launched in the Summer of 2009 with John and Toni’s son Mike on guitar and Marc’s sons Ian and Dan on drums and bass, respectively. They recorded Swerve, the band’s first album in 15 years, which was self-released in May 2010. Later that year, they recorded three new songs, dubbed The Summer Sessions, which were released that September. 2011 continued to bring exciting developments. First, Ed Seifert joined the group, bringing his distinctive guitar-picking and vocal talents. In August, STP released their sixth full-length album, Shine, on Dromedary Records. The highly-regarded indie label Bar-None Records released the Speed the Plough compilation, The Plough and the Stars in September 2013. It featured a CD that includes 17 songs from the band’s first four out-of-print albums tucked into a 12″ sleeve that also included a bonus LP with six brand new songs on one side titled Tag Sale and five live tracks from a 1993 appearance on WFMU’s Live Music Faucet on the other. 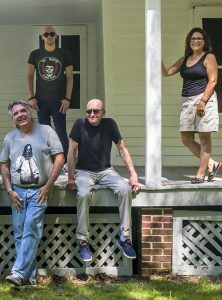 Early 2013 also saw the departure of Dan and Ian to pursue their own musical projects so the band recruited Cindi Merklee on bass and vocals, and John Demeski, filling the drum seat once occupied by his father Stanley two decades before. The band’s eighth album – Now – was released by Steve Fallon’s Coyote Records in January of 2016, the first new release on that legendary indie label in more than two decades. We were doing preproduction on three new songs – “Take Me,” “The Bitter End” and “Why We Fall In Love” – when our rhythm section Cindi and John told us they were leaving the band to pursue their post-grad degrees. We had recording dates set at our fave studio, Mix-o-lydian, so we decided to forge ahead. We drafted our former bassist Dan Francia and our friend Ken Meyer (Life in a Blender) on drums and headed out to the Delaware Water Gap. Things came together pretty seamlessly and we were off. Much of the rest of the album grew pretty organically from the notion that we were going to be a stripped-down ensemble for a while so let’s work at home and build on some pieces from John’s notebook, including a long-desired cover of Eno’s “By This River.” Somewhere along the way, Toni found “Crossing the Tizsa” in a songbook of Hungarian folk songs and came up with a lovely arrangement of the song, enlisting John’s mom for a spoken word section in the original Hungarian. Still in the home recording mode, it occurred to us that there were some songs from our earlier band The Trypes that had never been given the “full studio” treatment. So were reached out to our old bandmates – Marc Francia, Glenn Mercer, Elbrus Kelemet, and Brenda Sauter – who were more than enthusiastic about the prospect of recording again. That led to “Running On” and “Dark Continents,” along with plans to revisit more of the Trypes songbook in the future.